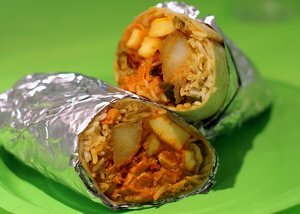 Indian wrap; from BAMBOO asia’s Facebook page. Opening on Tuesday July 12th for lunch service in the Financial District is ~BAMBOO ASIA~, a quick-service restaurant serving customized wraps, bowls, sushi, and salads from India, Vietnam, and Japan. Everything is priced at $8. Breakfast, lunch, and dinner will eventually be served. The project is from first-time owners Anjou Ahlborn and Sebastiaan van de Rijt. Hours are Mon-Fri 10:30am-7:30pm. 41 Montgomery St. at Sutter, 415-624-6790.